To get a FREE Ice Elements 2-Mintue Miracle Gel Sample, just select "Free Sample" on the top of the order form on the right side of the page and fill in your information. Dramatically renew the look and feel of your skin with the help of Ice Elements 2-Minute Miracle Gel. This amazing skin care treatment offers exclusive technology that lets you see a visible difference in just one use! You'll enjoy an intensive, deep cleansing beauty treatment with soothing aloe vera, natural botanical extracts and hyaluronic acid (a humectant). Ice Elements 2-Minute Miracle Gel gently exfoliates dead skin cells, removes dulling debris and excess oils. It is rich in natural moisture to help hydrate the skin, leaving it refreshed and vibrant. Ideal for use by both men and women, this sensitive skin friendly formula helps your complexion appear brighter, softer and glowing. 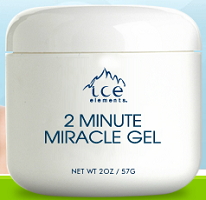 You will receive a sample of Ice Elements 2-Minute Miracle Gel for the free trial. Don't forget to ask about how you can get 2 Minute Miracle for FREE by sharing 2 Minute Miracle with your friends!